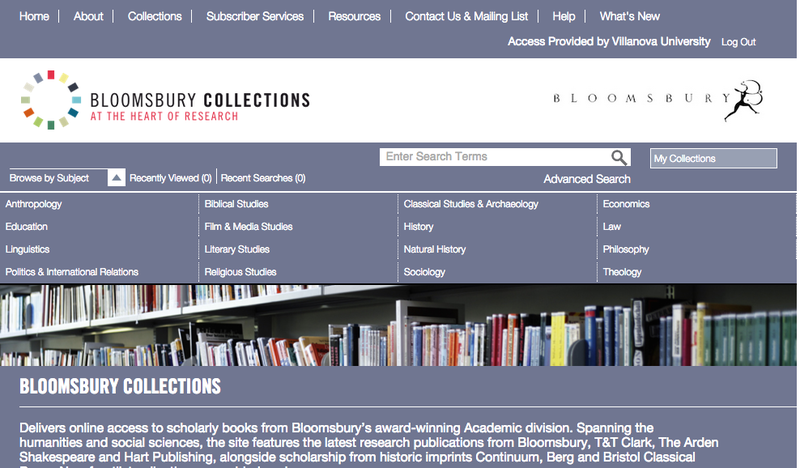 Until March 27 the library has a trial subscription to Bloomsbury Collections. This is a collection of e-books from Bloomsbury Publishing, which incorporates the previous Continuum, Methuen, and Berg imprints, among others. The collection is strong across a wide range of humanities and social science disciplines, including classical studies, history, literary studies, philosophy, political science and religious studies. Click here to access the collections. Some highlights: The Philosophy collection contains titles of particular interest in critical theory, postmodernism, political philosophy and aesthetics, as well as a number of excellent series, including Bloomsbury Studies in Continental Philosophy, Key Thinkers, and Ancient Commentators on Aristotle. The Literature collection contains the Arden Shakespeare, and the History collection has a large number of titles on ancient, medieval and early modern topics. The collection is easily searchable and can be browsed by subject, so it’s simple to find book chapters on your topic of research. It also features a particularly clear interface. Most titles include a book summary/abstract, and individual chapters can be read as HTML, or downloaded and printed as PDF files. Please contact Nikolaus Fogle (nikolaus.fogle@villanova.edu) with any questions or comments.